When the Ravens square off with the San Francisco 49ers in a preseason game tonight at M&T Bank Stadium, it marks the debut for several new starters. That includes new center Jeremy Zuttah, the replacement for Gino Gradkowski. Zuttah is eager to prove that the Ravens made a sound decision when they traded a 2015 fifth-round draft pick to the Tampa Bay Buccaneers to acquire him. Signed to a five-year, $18 million contract extension that included $6.5 million guaranteed after joining the Ravens, Zuttah is expected to solidify the middle line after a rough season last year where Gradkowski started every game. "It will be the first time lining up in a real game situation against somebody else," Zuttah said. "It will just be good to get out here with my teammates and show them what kind of player I am. The 49ers are one of the best teams in the league every year with one of the toughest defenses. So, it's great work to go up against guys like that." 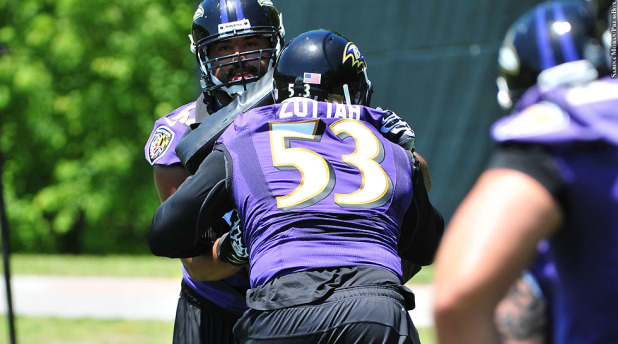 During training camp, Zuttah has shown he's capable of grappling with bigger defensive lineman. The 6-foot-4, 308-pounder has also displayed athleticism pulling and getting downfield to block. Zuttah said he has some familiarity with offensive coordinator Gary Kubiak's scheme from his time with the Buccaneers. "It's going really well," Zuttah said. "It's a new offense for not just me, but for everybody. We start on the same page. We're getting other as an offensive line and jelling together." Zuttah allowed no sacks last season for the Buccaneers. The Ravens allowed 48 sacks last season and finished 30th in rushing offense, 29th in total offense. The Ravens are counting on Zuttah to upgrade the center position. "Jeremy is a really intelligent guy," left offensive tackle Eugene Monroe said. "He’s putting us in the right places every play. He’s very athletic; very strong. He’s not the biggest guy around, but he’s probably one of the strongest. He’s an all-around complete player.